Okay, so years ago I wrote an article about taping hockey sticks and when to do it. I still stand by everything I said back then even though it was somewhat poorly written. 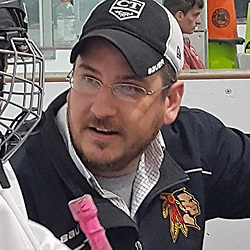 Anyway, recently, the coach of my oldest son explained to the kids how they should all be taping their sticks -- hockey player 101 -- and that got my wheels spinning. Hey, I think I might have something of value to add to this conversation! The fact is, the tape on your hockey stick is NOT going to make your child a better hockey player. That said, rather than continue to poke fun at the guys who re-tape their kid's stick before every game this around, I thought it might be a better idea to explain that there is a 'correct' way to tape your stick. Now I know there are NHL players who do it differently and even guys (like David Pastrnak) that barely use tape at all -- as I've said, the tape on the stick really is almost inconsequential. When you're a world class talent, as Pastrnak is, the tape job doesn't offer anything meaningful in return. For players at that level, the stick is nearly an extension of their body. They just feel and control the puck like it's in their actual hand. As for the rest of us? Well...maybe we could use the slight advantage a correct tape job can offer. So let's do this right. Before I begin, let me offer a little on my background. Though I worked with an AHL team for over two decades, I'm a terrible hockey player. Total hack. I mean, I'm really bad. I can skate okay but my shot is weak and my stickhandling is sub-par. Not at all ashamed to admit it. Really, REALLY, bad. And while that probably doesn't give you a whole lot of confidence in what I'm about to say, also know that in addition to being a terrible hockey player, I'm a nerd. A computer nerd. A science nerd. A physics nerd. Yeah, I was an engineering major. If there's one advantage I have over nearly every pro hockey player out there, besides a straight nose and a full set of teeth, it's that I understand how and why the things hockey players do...work. 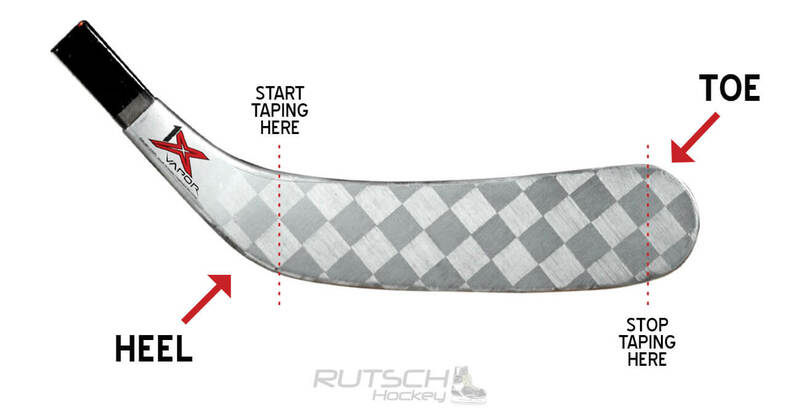 So, here's the most beneficial way to tape a hockey stick. Tape from heel to toe. I'd bet some out there reading this have been doing it the correct way, if accidentally, all along! If you like, you can stop reading here...cause we're about to get geeky explaining the reasons why this is the correct way. When you make pass or shoot a puck, if done correctly, the puck contact should start near the heel of the blade and make its way towards the toe before firing off in the direction you're sending it. The puck kind of "slides" towards the toe on the release, right? Well... that's not what's really happening. As any engineering major would know, since we all played way too much ultimate frisbee during our university days, the puck is not sliding down the blade. It's spinning. Or, it should be. If you've ever thrown a frisbee, the secret to a straight and powerful toss is the wrist flick just before you release the disc. This puts a lot of spin on the frisbee -- far more than just the rotation your elbow joint provides -- and allows it to fly through the air parallel to the ground which offers more distance and accuracy. When you throw a frisbee, if it wobbles, flutters, doesn't go very far, or veers off to one side, you're just not putting enough spin on it. Well, it IS you cause, well, you're doing it wrong...but the forces of physics are the reasons it's not working as well as you'd like it to. Relating back to hockey, a puck is exactly the same as a frisbee. A little smaller and a littler heavier...but they're both discs and the concept is exactly the same. For a shot or pass to be accurate, the puck MUST be spinning. Before anyone brings up the Russ Tyler's knuckle puck shot from the Mighty Ducks movie -- that shot would never go in consistently. A puck flipping around like that looks like a beachball to even the youngest goaltender. super easy to track and super easy to stop. A 1-inch high and 3-inch wide block is way harder to track. Shoot tiny frisbees...not beach balls. Now, let's look at a hockey puck. That pattern is a little like the treads on a car's tire. It generates friction that allows the put to stick to and "roll" down the blade of the stick like a car's tires do on the road. It's hard to tell, but the puck really does grab on to the blade of the stick. If the puck's edges were smooth, it'd be like having bald tires on an icy road -- it would just slide down the blade just like your car would slide off of the road. Zero control. So, right there, the design of the puck is causing it to stick to the blade and "spin" towards the toe when you begin a shot or pass motion. So how does the tape factor in? Well, the tape job can generate even more spin on the puck...but you have to tape it in the correct direction to get the full effect. The long and short of it is that you want the spin rate to increase and continue to gain momentum right up until the puck is released -- just like the last second flick of the wrist when throwing a frisbee. So, if the puck is rolling from the heel of the blade to the toe...what could make it roll faster? Taping from heel to toe, that's what. In that orientation, you're creating notches on the blade of the stick that the edge of the puck grabs on to...increasing the spin rate as it travels towards the toe. Essentially, you're giving the puck a push to spin faster. It's all about generating the maximum spin. The more notches, the faster it spins, the more accurate your shots and passes are. So, the above diagram is essentially the same as the previous one except this one uses a right-handed shot and I added some tape to the blade. I know, it's tough to see -- we'll get to that. The blue arrows, again, indicate the direction the shot or pass is being directed. The red arrow indicates how the puck should be moving from the heel of the stick towards the toe during the shooting or passing motion. 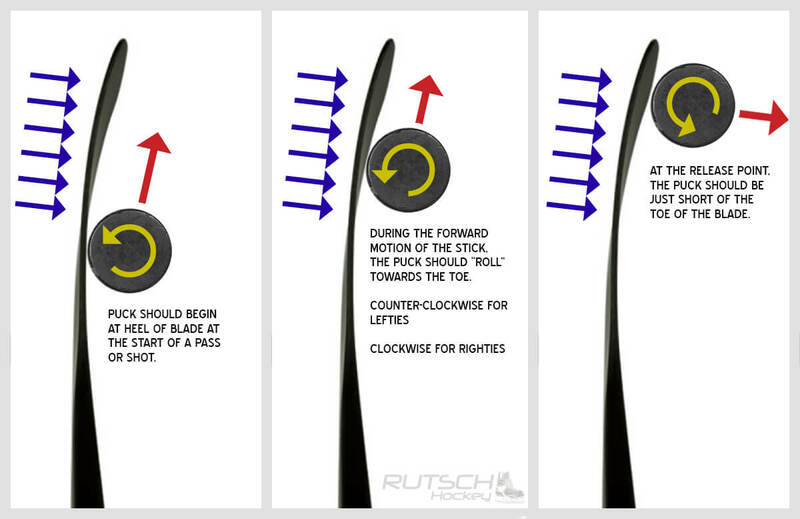 And the yellow arrow indicates the direction that the puck should be spinning while on the stick blade. What's new here is the green arrow. When you make a pass or take a shot, you're not just pushing your stick towards your target -- you're also pulling the heel of the blade in towards your body as you make your way towards your follow through. This towards-the-body motion is what initiates the spin on the puck. So where are those notches that I mentioned? Again, this is diagram showing a right-handed shot where the toe is on the right. Here you can see how the overlapping tape job creates notches on the face of the stick blade. If you rub your hand along the blade, you can feel them "grabbing" your hand. Far more resistance in one direction versus the other. There's more friction. Well, those notches grab the puck too, and give it an additional push, albeit tiny, that adds to the rotational speed of the puck. Every one of those additional green arrows is an added push to the spin that makes shots and passes more accurate. To be clear -- they don't push the puck toward the end of the blade faster. They slow that directional force down, actually, since they're pointing in opposite directions (the red vs. the green arrows). It's just increasing the velocity of the spin -- which is the yellow arrow. If you taped your stick the other way, from toe to heel, the notches don't exist. Well, they do, but instead of being little notches, they turn into tiny ramps so the puck is actually losing contact with the stick during the shooting or passing motion. That's bad. I know, it hurts the brain when visualizing stuff like this if you're not a nerd. I mean, conventional wisdom would make you think taping the stick from toe to heel would create a downward staircase for the puck to roll down, gaining speed along the way, right? And, yeah, as someone who's fallen down a flight of stairs a time or two, for sure, falling down certainly feels like a faster process than falling up. But on the stairs, what's making you call "down" faster is the force of gravity pushing down on you. Gravity is a vertical force. With the puck on the blade of a stick, it's not spinning end over end vertically. Gravity isn't really in play here -- besides keeping everything on the ice. We're trying to generate a horizontal spin which is caused by a frictional force and the combination of the markings on the edges of the puck and the direction of the tape job are what elevate it to an even stronger level. If you're still confused, here's the CliffNotes version: Tape from heel to toe. I also think it's important to mention that the tape job on a hockey stick will NOT increase the velocity of your shot. The only thing the tape does is enhance your ability to feel where the puck is on your blade and help generate for rotation on the puck for better control and accuracy. How many people out there tape the entire toe of the stick? My self-proclaimed expert advice? Stop. 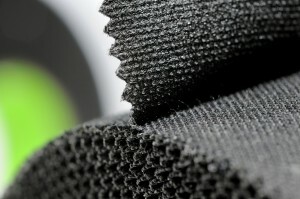 An additional purpose of the tape is to help the player "feel" where the puck is on the blade. Ideally, you always want it "on" the tape. By having the tape end short of the toe, your bottom hand should be able to feel that the puck is beyond the tape -- if you haven't released it already, NOW is the time to do it cause you're already late. By having the tape go alllllllll the way to the end, you never get that feeling. The puck can and will spin right off the end of your stick. You see it in professional hockey all the time -- guys "whiff" on a shot. More often than not, they don't whiff. The puck just rolls off the end of the blade without them realizing it. The un-taped toe of the stick is a lot like an outfield warning track in baseball. Now some will argue that tape over the toe "protects" the stick. Bust out your little scissors and trim it up all nice. Actually, while you're at it, you should probably just tape up your entire stick if protection is what you're really worried about -- I know a guy that made it to the NHL that did this for most of his career. I've got a query in to him to ask his reasons since I'm not entirely sure but he hasn't gotten back to me yet. Even better, remind your kids not to drag their stick blade on the ground through the parking lot. That's where the measurable damage occurs, anyway. Look, tape on a hockey stick can serve a purpose (as I've detailed above) or you can simply use it to make a fashion statement. If you're taping the toe, you're drifting in to the latter category. And on the topic of fashion statements -- can people stop using coloured tape on their blades? There's a reason no one at the professional level uses it. It looks ridiculous. Now on the black vs. white debate, I've heard it all. Defense should use white tape to "hide" their poke checks and forwards should use black so the goalie can't get a good read on where the puck's release point is. Um...yeah. A good poke check either hits the puck or it doesn't -- guys aren't stickhandling better around white tape jobs than they are around black -- I'm certain someone nerdier than I has analyzed that. And EVERY goalie knows a good shot is coming off the stick just shy of the toe. You know, where I've said your tape job should end. Black or white doesn't matter. 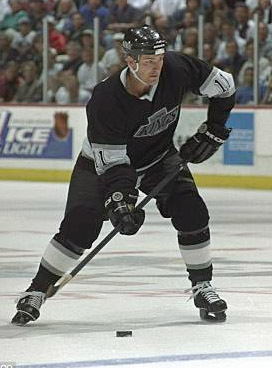 Gretzky used black tape throughout his career. So did Mario Lemieux. Sidney Crosby uses black tape too. Connor McDavid uses white tape and so does Auston Matthews. Alex Ovechkin goes back and forth. Okay, so now we've covered how to tape, why to tape, and which colour you should use. Up next is what kind of tape! Over the past few years, something as simple as hockey tape has gotten really convoluted. Now, in addition to all of the colors and patterns, there are different widths, those big sticker things, those rubber stick wraps, grip tape, waxed tape, friction tape, and a whole host of other things. Save all of that fancy stuff for the top of your stick. By all means, host your fashion show up there. At the bottom, stick to good old-fashioned cloth hockey tape in white or black. Now, something I've noticed over the past few years is that even with the "generic" tape, there are a couple variations available now. One time at the pro shop, the woman at the counter handed me tape that had a serrated edge rather than a straight edge. I found it a little odd but the premise was that the edge made it easier to tear easier by hand. That what Renfrew, the manufacturer, claims in addition to saying that it last longer, is stickier, and is just better overall. I mean, I remember being able to rip tape with ease as a kid. Now, when I try that, even as an adult, the tape just folds over and sticks to itself. Even using my teeth is a 50/50 gamble. Anyone else over 40 notice that? At first, I'd attributed it to better manufacturing these days -- maybe it "is" better overall -- but I think it's due more in part to the fact that ice rinks aren't FREEZING like they used to be. The tape I was using in the 1980's, and tearing with ease, was nearly frozen. That has to be the reason. Anyway, the serrated edge on this new tape -- available exclusively in black, by the way -- doesn't make tearing any easier. It doesn't. Even when aided by my teeth, It still folds over and sticks to itself creating a ton of wasted tape each time I try it. But look at those little triangular teeth on the edge! 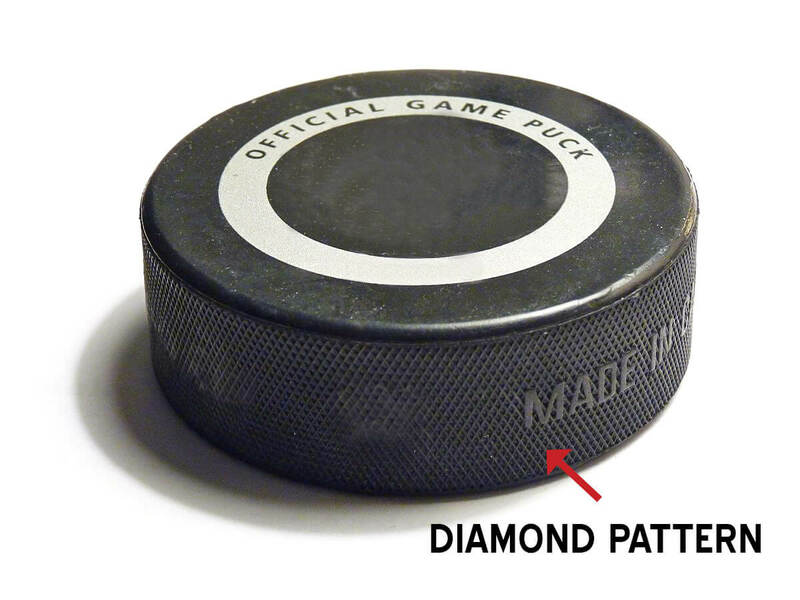 Wouldn't those sink in nicely on the diamond print on the edge of the puck? So, for the greatest advantage, tape your blade from heel to toe with the black tape that comes with a serrated edge. No joke -- that's the very best way to do it. Oh, and regarding that player that used to tape his stick up all the way -- he did get back to me within a matter of hours! So lucky to have so many contacts that have made it to the highest level and love how willing they are to answer questions from left field. His name is Brad Smyth and while he never quite established himself as an NHL regular, he had some utterly ridiculous point totals in the American Hockey League while being a veteran presence for guys you probably have heard of like Jason Spezza and Mike Cammalleri. For the 1995-96 season, he put up 68 goals and 58 assists in just 68 games. A few seasons later, he tallied 50 goals in a single season for the Hartford Wolf Pack. Yeah, he had some decent hands. Scoring machine right up to the day he retired. Regaring the unusual tape job, he did it originally for the added weight that it gave the stick and then he grew accustomed to the added grip it provided too. I wouldn't suggest following his lead -- use a wood stick if you're looking for more weight and too much grip on the shaft will greatly limit your stick handling abilities... It's just not a great idea. Then again, who am I to question a guy who played wing on a line with Wayne Gretzky?